Is it worth installing solar in Scotland? Installing solar power in Scotland is beneficial even though it doesn’t receive as much solar irradiation as somewhere like Africa, India or Southern Europe. Looking at the solar irradiation map below, we can see that the solar irradiance in the UK and Scotland is not too dissimilar to Germany – the largest photovoltaic (PV) market in the world, which had 24.7 GW of PV installed at the end of 2011 (European Photovoltaic Industry Association: EPIA Market Report 2011). According to “The Renewable Energy Review”, a May 2011 report by the Committee on Climate Change, the estimated practical resource for solar in the UK is 140 TWh/yr. These figures will be different for Scotland which has a large proportion of the UK’s wave and offshore resource, but what this graph shows is that the solar resource is significant. The maps below show the performance data from a range of PV installations across the UK. As you can see some installations in Scotland, like the ones in the Dundee/Aberdeen area, regularly perform just as well as installations down south. Interestingly in April and May installations on the west coast also performed as well as some in Cornwall. Often, for PV, the quality of the installation has a more significant impact than the solar irradiance. Maps taken from the Sheffield Solar Farm “Microgen Database”. How much electricity can you expect to generate from a PV installation in Scotland? “A 3kWp system in Scotland can generate around 2,300 kilowatt hours of electricity a year - that's around three quarters of a typical household's electricity needs - and will save over a tonne of carbon dioxide every year.” Energy Saving Trust website. 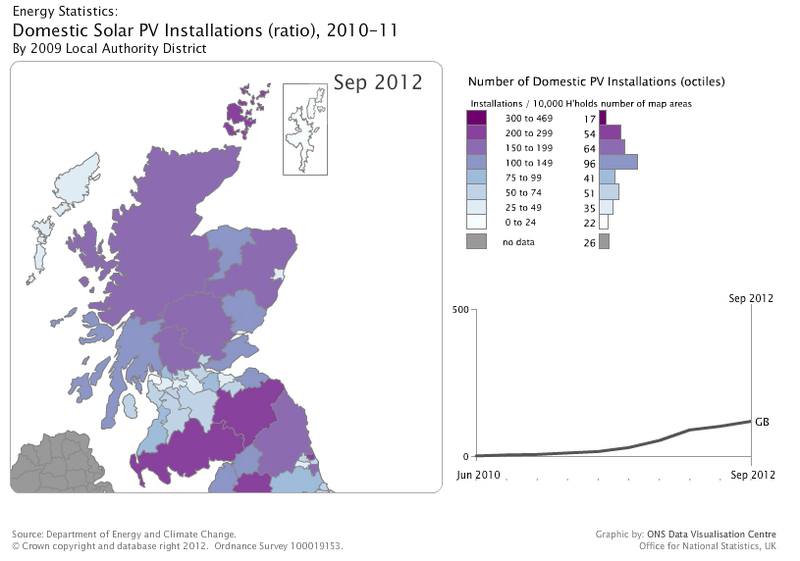 This data on domestic PV installations in Scotland is taken from the DECC website. It is a snap shot from an interactive map. On the website you can click on each locality to get more in-depth information. Business’ can also make savings on their energy bills by installing PV. The graph opposite shows the electricity generated by a 49 kW system installed by an SME in Scotland. After 6 months the system has generated 29,091 kWh - 78.9 % of the estimated annual generation predicted. So far they have generated an income of at £8,720 from the Feed-in-Tariff (rate 34.5p/kWh) and £352 from Export Income (rate 3.1p/kWh) and made savings of £1,764 on their Energy Purchase (rate 11.65p/kWh). The system was financed by a Small Business Loan from Energy Saving Scotland. Case study information courtesy of Sustainable Opportunity Solutions.